We are doing things differently in this review — it is effectively split in two and running over back-to-back issues. Coromal has been in the news a lot with Apollo's acquisition of the brand (and that of Windsor) being the main story but it has also been creating a buzz with the release of a new construction method and new models. It is for the latter that we are splitting this review, that and we are often asked to validate living with test caravans more than is often possible in our typical day or two of testing. 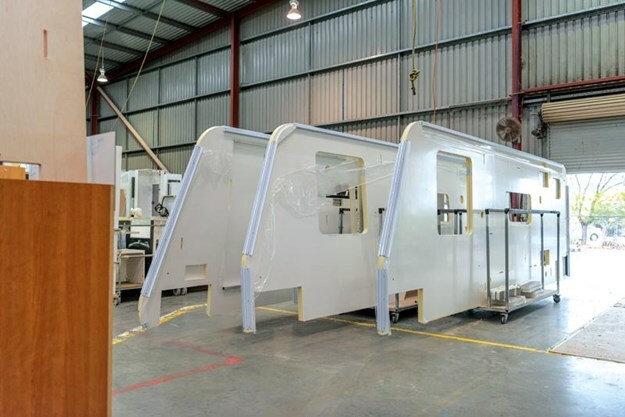 So the plan was to spend a few days in the Perth, WA factory getting to know the new ideas and methods and how they translate into a caravan. 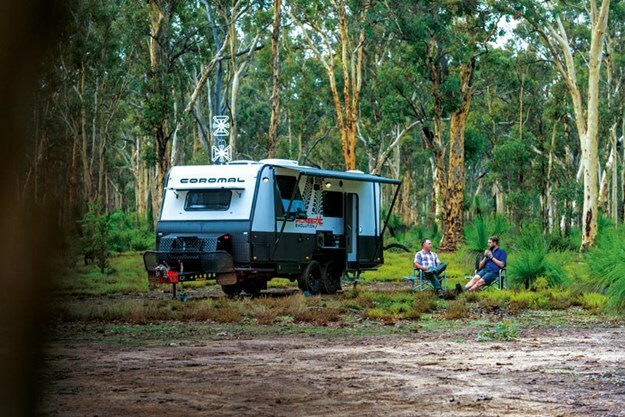 Then, a few weeks later, a seven-day sojourn up the coast and inland to see how it goes on the blacktop, dusty rocks of the Pilbara and what it is like to live with for the 580 issue of Caravan World, on sale October 4. We arrived in Perth a few weeks before the news broke that the brand was to relocate to Brisbane sometime in 2019. This is a shame as I took a great deal away from the factory itself. 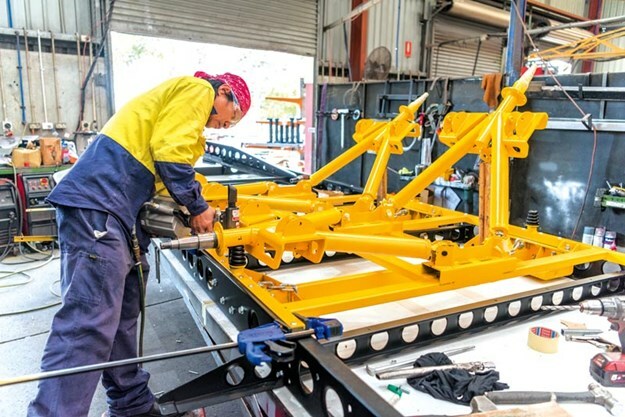 The efficiency-driven team operate one of the best manufacturing plants in Australia, I believe. Our first taste of the sophistication of the company was in the main office block. After being greeted by the history of the company, proudly displayed throughout the main entrance, my team and I were met by a bank of offices with rows of staff manipulating computer-aided designs of all things from chassis to cupboard design. I would later learn how precise the outcomes of this would be; this accuracy-led process is a stark difference to many manufacturers I have visited (I’m looking at you, most of Campbellfield), and I hope Apollo maintain the systems and have heard confidently that its team intends to. Out on the factory floor, the size of the operation takes time to appreciate partly due to the 20,000sqm floor space but also due to its hum of activity — it is a busy place. 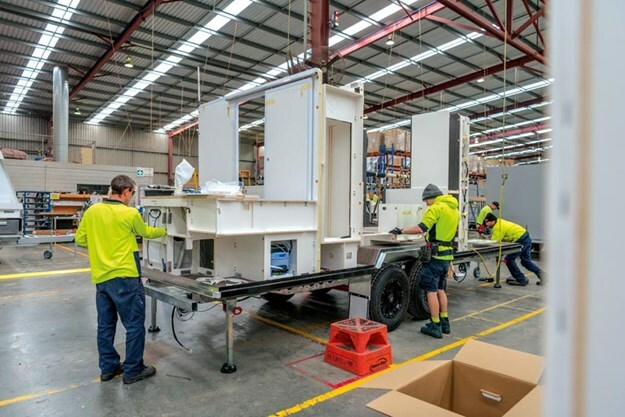 Like most caravan builders that output more than 1500 vans a year, the build process follows a line with individual teams performing set roles, be it mounting floors and connecting underfloor plumbing or installing cabinets. Each team follows a build sheet with an allocation of time for each task, completes it, checks it and passes it on to the next team to complete their part of the process. A key step in this that cannot be understated is checking. 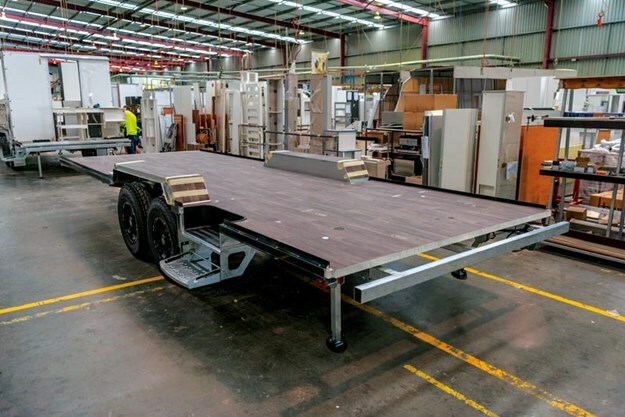 We were looking at the fifth new-model Pioneer Evolution 632S so the team were still learning about the requirements of each step but there was still an independent member of staff, not assigned within the build team, who was appraising quality. I jokingly asked how much tension there was between the two and, though my question was clearly pointed, I was told it was healthy with both groups looking to how best help each other’s roles. The major components to the build are a floor, walls, a roof and a chassis. Sound familiar? You’ll probably also be disappointed to hear the outcome is a familiar size and shape, like that of most caravans. Where the difference lies is in the almost indestructible 40mm polypropylene honeycomb floor, the thick foam-centred walls and roof and how it all goes together to create a lightweight yet tough offroader. 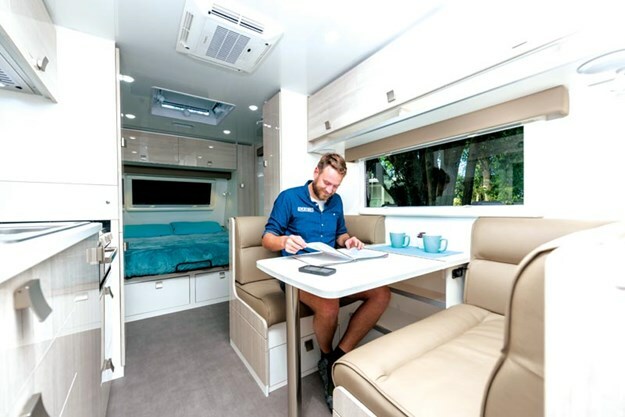 The floor is inherently light and rigid due to pockets of air throughout and has vinyl added on site before being laid to avoid the dreaded lifting laminate we see in older caravans living in hotter climates. Being made of the same material most chopping boards are made of, the floor is resistant to rot and exceptionally hard wearing. The walls are 30mm thick, the roof 55mm thick and both are made out of foam sandwiched between two fibreglass skins and, interestingly, are made on site. This is significant as the material is able to be imported but at set lengths and at variable costs. Coromal making its own means less waste, on-demand delivery and better cost control — all good things for the consumer by virtue of reduced costs to you, the buyer. Both are patch repairable and easily so. 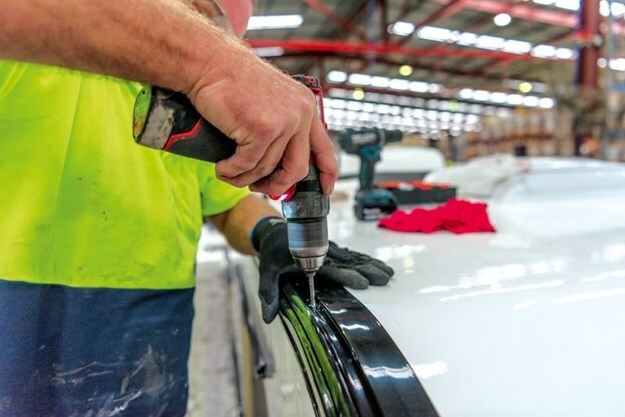 A section can be cut out and a new piece installed, much like gyprock repair at home and, by using composite panels and doing away with the need for an internal frame, the body of the van is significantly lighter than a traditionally built unit. Approximately 300-500kg is saved on the 6m 632S and with the lighter body comes another weight related benefit. For offroad warriors there is another benefit — great insulation properties. The thick foam core works exceptionally well at keeping heat in during colder months and heat out during our long hot summer. As mentioned earlier, the process starts in the design office with material analysis and exacting measurements. It also includes programming for holes for amenities and importantly, notches for exactly locating and bonding cabinets between the floor, roof and walls. After the chassis is rolled in, the honeycomb floor is bolted down and the internal cabinetry is installed. This is not unusual timing but by having notches already in the floor, it is a remarkably quick process. From there bespoke alloy extrusions come into play and it is a process of complicated beauty. Dubbed Future Teck, the body of the van comes to life through a range of alloy extrusions specifically designed for the job. The exposed edges of the walls and floor are capped with tall edges that create barriers to water and dust. These are then mated together with screws and sealant adding strength. For water to make it past the sealant and extrusion is near impossible, it is a clever system. The roof is single piece from front to back. Coromal routers in millimetre-perfect cuts into the 55mm-thick sheet of the same material as the walls. These cuts allow the roof to be rounded at the front and rear and, importantly by being one piece, lowers the risk of water ingress. There are still holes in the roof for vents, AC and antennae but the reduced number of holes can only be a good thing for waterproofing. Joining the walls to the roof is the same process as the walls to floor but the extrusion is more complicated with channels for adding in a rubber-esque sealing cap and for mounting items such as awnings. A lot of thought has gone into it for future use which I am happy to see. The lightweight body requires a less substantial chassis but there is more to the story. 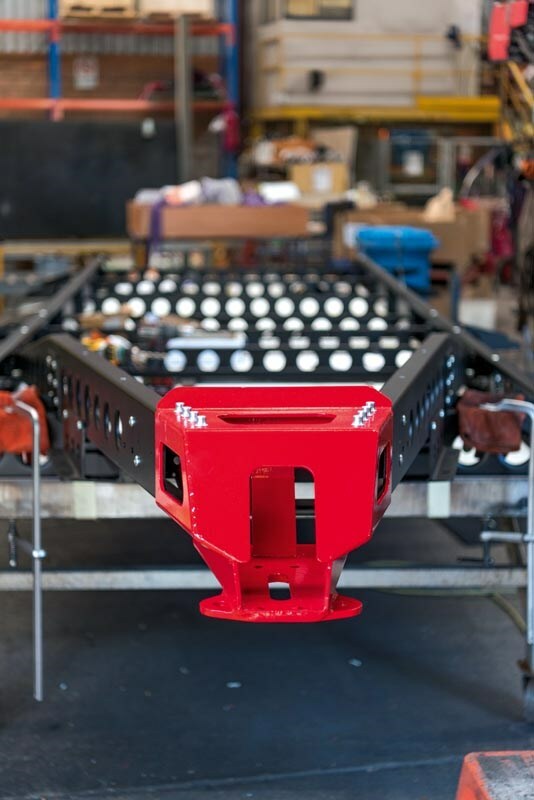 The outcome of the Future Teck process is a body so stiff and strong the chassis is able to be lightened again. This doubling down on the benefits of the Future Teck design isn’t left to a lightweight galv box section though, it gets a radical new design too — the FRV chassis. We first saw the FRV chassis at the Sydney Supershow in April. There it drew a crowd for its radical swiss-cheese looks before leaving anyone with an interest in technical design in awe. Designed through finite element analysis (FEA), every major surface has been dimple-stamped to resemble swiss cheese. To some it may be unsettling, but the process creates tension on the edge of the holes, dramatically adding strength while removing weight. It is a process seen in plane wings and in heavy lifting equipment. The main material used is 550 grade steel which is galvanised then powdercoated for durability and construction is predominantly rivet and bolt, not welded. This is again a good thing as it allows some movement and removes the chance of heat-affected weak points. The outcome is a chassis that looks like no other, weighs some 130kg less than a traditional box-section option and should last the test of time. We will dive deep into the capacities to live off grid with the 632S in the next issue of Caravan World but I can confidently say that by combining the smarts of FEA in the chassis, fully-developed computer-aided modelling of the caravan body with clever and cutting edge materials joined with brilliant extrusions has created a caravan that takes manufacturing to a whole new level. The effect for an offroader is a van with a high payload-to-Tare weight that is well insulated, rot-resistant and easy to repair. 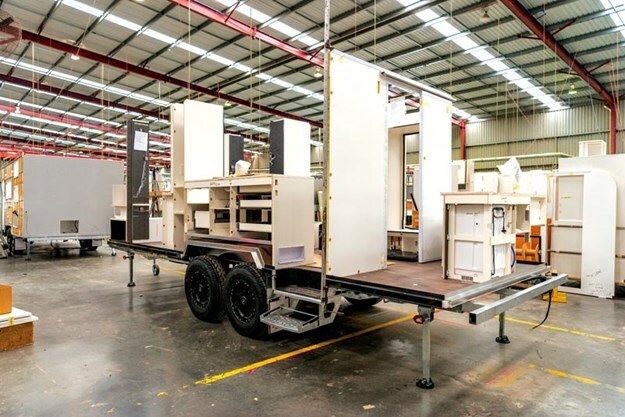 How it tows and what it is like to live with, you will have to wait until next time for, but for this issue, the future of caravan manufacture is now. Look in issue 580 on sale October 4 where we rate and put the 632S through its paces over 2500km of coastal and inland driving from WA’s Coral Coast to Karijini.